Mutations result from errors during the DNA replication process or other types of damage to DNA (such as may be caused by exposure to radiation or carcinogens). “ Left-handedness is a good marker of a high mutational load. They found higher levels of left-handedness in atheists than in followers of most major religions. Since the industrial revolution, the hold of natural selection on humanity has weakened. “We developed better and better medical care, easier access to healthy food and better living conditions. Child mortality collapsed down to a tiny level and more and more people with more and more mutant genes have survived into adulthood and had children,” Dutton says. Atheism, as defined by the Stanford Encyclopedia of Philosophy, the Routledge Encyclopedia of Philosophy, and other philosophy reference works, is the denial of the existence of God. The General Social Survey (GSS) is the "largest project funded by the Sociology Program of the National Science Foundation. Except for the U.S. Census, the GSS is the most frequently analyzed source of information in the social sciences." As you can see above, the social scientists at the General Social Survey do not define as strictly as encyclopedias of philosophy and many other reference works. As a result, in reporting their survey results there is some overlap with individuals who some may consider to be merely agnostics. 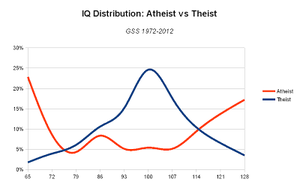 Now, the statistically naive might look at this chart, note that the +2SD theists only account for 3.5 percent of the theistic population, and assume that this means there are more highly intelligent atheists than highly intelligent theists. This is not the case. As it happens, there are 11.4x more +2SD theists who either know God exists or believe God exists despite having the occasional doubt than there are +2SD atheists who don't believe God exists. ↑ Alzheimer's disease and intelligence. by Yeo RA, Arden R, Jung RE., Current Alzheimer's Research, 2011 Jun;8(4):345-53. Smart, J. J. C. (August 8, 2011). "Atheism and agnosticism". The Stanford Encyclopedia of Philosophy (Spring 2013 Edition), Edward N. Zalta (ed.). Retrieved July 17, 2014. Sarfati, Jonathan, Ph.D. (23 June 2007). "Atheism is more rational?". Retrieved July 17, 2014. See Creation Ministries International, Jonathan Sarfati. Day, Donn R. (2007). "Atheism - etymology". Retrieved July 15, 2014.